Global Vision Advisors is a team brought together with over 40 years of financial advisory experience. 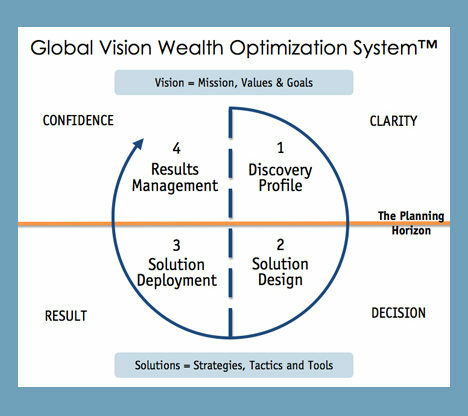 Global Vision Advisors is a wealth advisory firm providing individuals and families with financial counsel. We deliver comprehensive independent money management solutions. It helps to know where you’re going before you start out on a journey. Together we can help you clarify your vision and achieve your way to success. Our independence and value proposition set us apart from other advisors. In a profession based on objective advice, true independence allows Global Vision Advisors to offer tailored recommendations and impartial guidance tailored to each individual client. We are not forced to sell proprietary products or meet any sales quotas. We are focused on what is best for you and your financial goals. Will Bill Gates be remembered by the money he accumulated or the difference he made both through the creation of Microsoft and the impact of his foundation? We use this example because it is important not to think of whether we do one or the other. Some of us are socialized to think that either we contribute or we accumulate. But perhaps it is through contribution that we receive more of what we desire for ourselves. If we consider the people in history who are most revered, it is for what they gave not for what they got that we hold them in such high esteem. We all have something to give. Living in the question of “what can I give” may be a path to living the way we all hope to live.